The aim of the current experiment was to determine the effect of harvest stage on the chemical composition, in vitro gas and methane production, organic matter digestibility and metabolisable energy of Bituminaria bituminosa. After determination of chemical composition, Bituminaria bituminosa hay was subjected to the test of in vitro gas production. The metabolisable energy and organic matter digestibility of Bituminaria bituminosa hay were determined using the gas production at 24 h incubation. Harvest stage had a significant effect on the chemical composition of Bituminaria bituminosa hay. Dry matter, neutral detergent fiber and acid detergent fiber contents of Bituminaria bituminosa hay increased while crude ash, crude protein contents and relative feed value decreased with advancing maturity. Dry matter, neutral detergent fiber, acid detergent fiber, condensed tannin and relative feed value of Bituminaria bituminosa hay ranged from 20.1 to 33.9 %, 45.0 to 66.1 %, 25.8 to 42.5 %, 0.96 to 1.25 % and 78.3 to 141.85 respectively. On the other hand, crude ash and crude protein of Bituminaria bituminosa hay ranged from 7.96 to 9.51 and 14.2 to 23.6% respectively. In vitro gas production, methane production (as ml), metabolizable energy and organic matter digestibility of Bituminaria bituminosa hay ranged from 41.8 to 50.4 ml, 6.95 to7.70 ml, 9.28 to 11.0 MJ kg-1 DM and 63.6 to76.5 % respectively and decreased with increasing maturity whereas the percentage of methane increased with increasing maturity. Although the inevitable loss in nutritive value of Bituminaria bituminosa plant with advancing maturity, even at the seeding stage, Bituminaria bituminosa plant could provide hay of acceptable quality for ruminant animals to meet their requirements. In addition, low level of condensed tannin in Bituminaria bituminosa offers an opportunity to decrease the risk of bloat for grazing ruminant animals. But this needs verification with further testing. Bu çalışmanın amacı, katran yoncası otunun besin madde kompozisyonu, gaz üretimi, metan üretimi, organik madde sindirim derecesi (OMSD) ve metabolik enerjisi (ME) üzerine hasat zamanının etkisini belirlemektir. Üç farklı dönemde hasat edilen katran yoncasının kompozisyonu belirlendikten sonra in vitro gaz üretim testine tabi tutulmuştur. Katran yoncasının yirmi dört saatlik gaz üretim değerleri kullanılarak ME ve OMSD belirlenmiştir. Katran yoncası otunun kuru madde (KM), nötral deterjan lif (NDF) ve asit deterjan lif (ADF) içerikleri hasat zamanının ilerlemesiyle birlikte artmasına rağmen ham kül (HK), ham protein (HP) içerikleri ve nispi yem değerinde (NYD) önemli azalmalar meydana gelmiştir. Katran yoncası otunun KM, NDF, ADF ve kondense tanin (KT) içerikleri ve NYD’leri farklı hasat devrelerinde % 20.1 ile 33.9, % 45.0 ile 66.1, % 25.8 ile 42.5, 0.96 ile 1.25 ve 78.3 ile 141.85 arasında değişmiştir. Hasat zamanının ilerlemesiyle birlikte katran yoncası otunun in vitro gaz ve metan üretimi (ml), ME ve OMSD değerleri sırasıyla 41.8 ile 50.4 ml, 6.95 ile 7.70 ml, 9.28 ile 11.0 MJ kg-1 KM ve % 63.6 ile 76.5 arasında değişmiştir. Hasat zamanının ilerlemesiyle birlikte kaçınılmaz kayıplar olmasına rağmen katran yoncasının tohum bağlama döneminde bile ruminant hayvanların besin maddeleri ihtiyacınının karşılanması amacıyla rasyonlarda kullanılabileceği ileri sürülebilmekle birlikte bu konuda daha detaylı çalışmalara ihtiyaç bulunmaktadır. AOAC., 1990. Official Method of Analysis. Association of Official Analytical Chemists, 15th Edition, Washington, DC. USA. Barry, T.N., Blaney, B.J., 1987. Secondary compounds of forages. In: Hacker, J.B. and Ternouth, J.H. (eds) Nutrition of Herbiv¬ores. pp. 91–120. (Academic Press: Sydney). Canbolat, O., 2012. Potential nutritive value of field bindweed (Convolvulus arvensis L) hay harvested at three different maturity stages. Journal of the Faculty of Veterinary Medicine, Kafkas University, 18 (2), 331-335. Guven, I., 2012. Effect of species on nutritive value of mulberry leaves. Journal of the Faculty of Veterinary Medicine, Kafkas University, 18 (5), 865-869. Johnson, K.A., and D.E. Johnson. 1995. Methane emissions from cattle. Journal of Animal Science, 73, 2483–2492. Kamalak, A., Atalay, A.I., Ozkan, C.O., Kaya, E., Tatliyer, A., 2011. Determination of potential nutritive value of Trigonella kotshi Fenzl hay harvested at three different maturity stages. Journal of the Faculty of Veterinary Medicine, Kafkas University, 17(4), 635-640. Kamalak, A., Canbolat. O., 2010. Determination of nutritive value of wild narrow-leaved clover (Trifolium angustifolium) harvested at three maturity stages using chemical composition and in vitro gas production. Trop. Grassland, 44(2), 128-133. Kaplan, M., Kamalak, A., Kasra., A.A., Guven, I., 2014a. Effect of maturity stages on potential nutritive value, methane production and condensed tannin content of Sanguisorba minor hay. Journal of the Faculty of Veterinary Medicine, Kafkas University, 20(3), 445-449. Kaplan, M., Kamalak, A., Ozkan, C.O., Atalay. A.I., 2014b. Effect of vegetative stages on the potential nutritive value, methane production and condensed tannin content of Onobrychis caput-galli hay. Journal of the Faculty of Veterinary Medicine, Harran University. 3(1),1-5. Kaya, E., Kamalak, A., 2012. Potential nutritive value and condensed tannin contents of acorns from different oak species. Journal of the Faculty of Veterinary Medicine, Kafkas University, 18(6), 1061-1066. Lohan, O .P., Lall, D., Vaid, J., Negi, S. S., 1983. Utiliza¬tion of oak tree fodder in cattle ration and fate of oak leaf tannins in the ruminant system. Indian Journal of Animal Science, 53, 1057–1063. Lopez, S., Makkar, H.P.S., Soliva, C.R., 2010. Screening plants and plant products for methane inhibitors. In: Vercoe PE, Makkar HPS, Schlink A, (Eds): In vitro screening of plant resources for extra nutritional attributes in ruminants: Nuclear and related methodologies. London, New York, pp. 191-231. Makkar, H .P. S., Blummel, M., Becker, K., 1995. Formation of complexes between polyvinyl pyrrolidones or polyethylene glycols and their implication in gas production and true digestibility in vitro techniques. British Journal of Nutrition, 73, 897-913. Makkar, H.P.S., Singh, B., Negi, S. S., 1989. Relation¬ship of rumen degradability with microbial colonization, cell wall constituents and tannin levels in some tree leaves. Animal Production, 49, 299–303. Menke, K.H., Raab, L., Salewski, A., Steingass, H., Fritz, D., Schneider, W., 1979. The estimation of digestibility and metabolizable energy content of ruminant feedstuffs from the gas production when they incubated with rumen liquor in vitro. Journal of Agricultural Science (Cambridge), 92, 217-222. Menke, H.H., Steingass, H., 1988. Estimation of the energetic feed value obtained from chemical analysis and in vitro gas production using rumen fluid. Animal Research and Development, 28, 7-55. Singleton, V.L., 1981. Naturally occurring food toxicants: Phenolic substances of plant origin common in foods. Advances in Food Research, 27,149-242. Stavarache, M., Samuil, C., Popovici, C.I., Tarcau, D., Vint, V., 2015. The productivity and quality of alfalfa (Medicago sativa L.) in Romanian forest stepe. Notulae Botanicae Horti Agrobotanici, 43(1), 179-185. Rohweder, D.A., Barnes, R. F., Jorgensen, N., 1978. Proposed hay grading standards based on laboratory analyses for evaluating quality. Journal of Animal Science, 47, 747-759. Ulger, I., Kamalak, A., Kurt, O., Kaya, E., Guven, I., 2017. Comparison of the chemical composition and anti-methanogenic potential of Liquidamber orientalis leaves with Laurus nobilis and Eucalyptus globulus using an in vitro gas production technique. Ciencia Investigacion Agraria, 44(1):75-82. Valente, M.E., Borreani, G., Peiretti., P.G., Tobacco, E., 2000. Codified morphological stage for predicting digestibility of Italian ryegrass during the spring cycle. 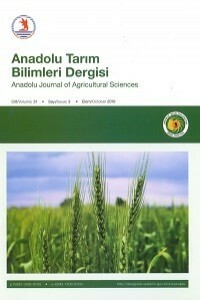 Agronomy Journal, 92, 967–973.